Every blackjack player has found themselves in a situation where they are sitting at the table next to a friend, with both of them staring at terrible hands. But a solution would be available, if only it were legal: what if the two players could trade a card, suddenly making both hands much more playable? Unfortunately, that’s a tactic that is likely to get both players thrown out of a casino for cheating, rather than helping their chances. But in Blackjack Switch, that’s exactly what you’re allowed to do. In this variation on the classic card game, you’ll make two bets to play two separate hands, and have the option of switching two of the cards if that will help your chances. It’s an entertaining twist that makes the game way more complex, but also greatly improves your chances of creating winning hands each time you play. 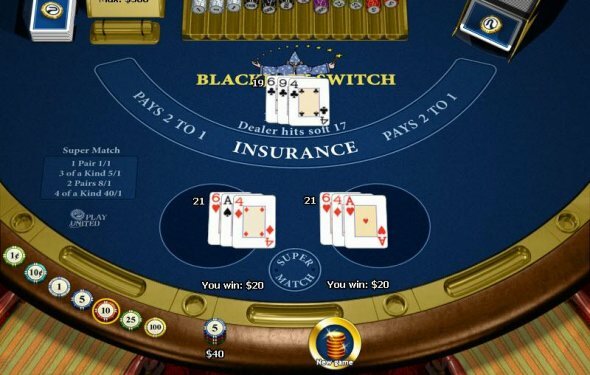 Blackjack Switch uses most of the rules of traditional blackjack, so if you understand how to play that version of the game, you’ll have a grasp of the basic gameplay here as well. However, there are some important changes that you’ll need to be aware of before you jump into your first hand. At the beginning of each hand, the player is required to make two bets of equal size, each of which will be associated with one of two hands. The player is then dealt two standard blackjack hands face up. As usual, the dealer will check for a blackjack; if he has one, all player bets immediately lose (except for blackjacks, which push). The player then has the option to switch the second cards dealt to each hand. In most online versions of the game, this will be the “top” card. It’s important to remember which cards can be switched, as the player doesn’t have the ability to make whatever hands they desire out of the four cards they have been dealt. However, if you make a mistake while switching, games will typically give you the option to freely switch back and forth as much as you want until you are satisfied with your decision. After deciding on the switch, the player will then play out the two hands as normal. The options to hit, stand, split and double can be utilized just as in a normal blackjack game. Once the player finishes player their hands, the dealer will reveal their second card, and finish playing their hand, standing on all hands of 18 or more as well as “hard” 17s. The hands are then scored as in regular blackjack, with a couple of notable changes. First, the player will only win even money on all wins, including natural blackjacks. Secondly, a dealer hand of 22 will push against any non-blackjack hand for the player. Which US Casinos have Blackjack Switch. This answer is extremely fluid as there are casinos that add or discontinue the game or change the rules every day. Any list would be in need of very frequent updates. Let it be noted that outside of Las Vegas the game is very rare. I refer the reader to "The Big Book of Blackjack" for the most excellent coverage of this fascinating BJ variant.